Alkali Resistant (AR) Glass Fibers are designed specifically for use in concrete. They are manufactured from a specially formulated glass composition with an optimum level of Zirconia (ZrO2) to be suitable for use in concrete. 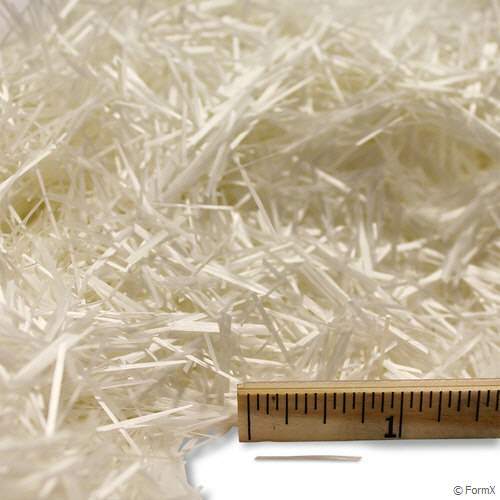 AR Glass Fibers are particularly suitable for Premix GFRC and other mortar and concrete reinforcement applications. They have high tensile strength and modulus, do not rust like steel, and are easily incorporated into concrete mixes. Our fibers are 19mm (3/4”) in length, with 200 filaments per strand bundle and a filament diameter of 18 microns. While the bundles are designed to resist breaking down during mixing, care must be given not to overmix. Compared to monofilament fibers (PVA, AC50), bundled fibers are more likely to be visible in finished surfaces if precautions are not taken. Typical load range: 3% by weight of the total mix, or 1.5-1.75 lb. (0.68-0.79 kg) per bag of Buddy Rhodes blended concrete mix. All of our alkali resistant glass fiber products are manufactured in compliance with ASTM C1666/C 1666M, EN 15422 and under recommendations of PCI and GRCA.